Greetings fellow Vintage Drum Fans! This June installment of Vintage Happiness is featuring a set that had long been a bucket list item of mine. Finally this time last year I was able to locate one in excellent condition and, since my birthday is in June, I decided that it was time to “pull the trigger” on a kit I had been dreaming about for some time. I purchased this kit from the great Donn Bennet Vintage Drum Vault. Don was an extremely great guy to deal with and I got to chat with him on several occasions. He has some amazing drums for sale. This set is a 1962 Ludwig Super Classic in the rare “Sparkling Galaxy Pearl” finish. The set consists of a 14x22 bass drum, 9x13 tom and a 16X16 floor tom. These drums feature all pre-serial number Keystone badges. Luckily, the drums are date stamped inside so it was easy to figure out the year of manufacturing. The drums are stamped March 12 1962 in the tom & foor tom, and April 17 1962 in the bass drum. 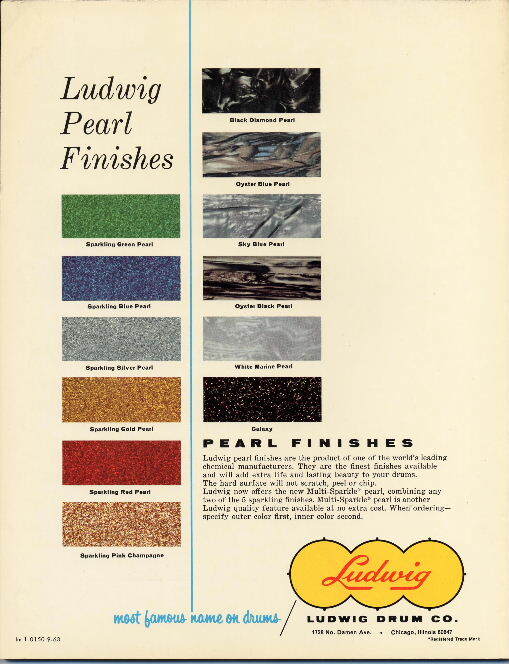 As with many Ludwig kits of the early 60’s, the bass drum interior is not painted white while the tom interiors are. I like that as the grain on the bass drum interior is just beautiful. 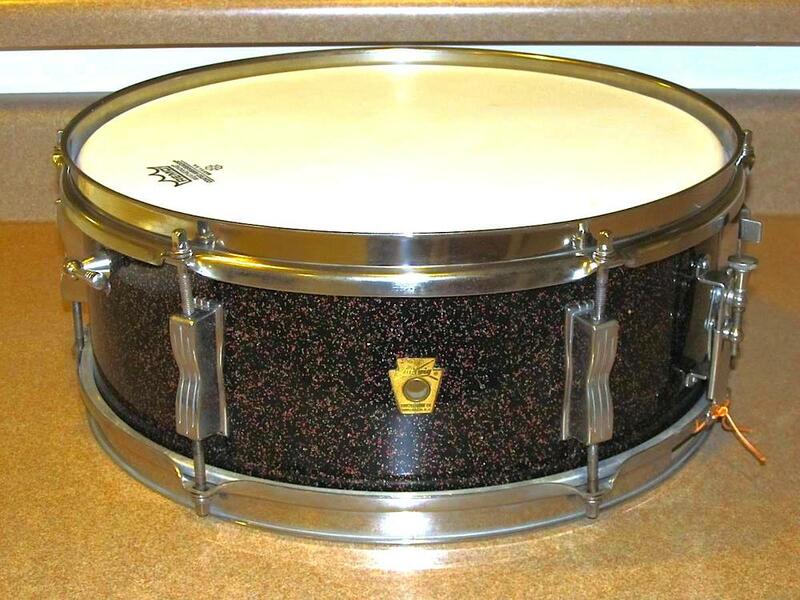 The drums are in excellent condition - no modifications and nothing missing. There is some very minor fade on the front of the 13” tom but it still shows strong pink and blue in the sparkles there. All the shells are extremely clean and free of any scratches or dings. I was able to Novus out the minor scratch on the top of bass drum . What’s amazing is ALL of the chrome is totally pit free - zero rust anywhere. All the wrap seams are tight on all the drums. The bearing edges are original and in remarkable shape. Red felt P-4067 Baseball bat tone controls are on on both toms. The drums are 100% original with COB hoops all around. It always amazes me to find a set in this kind of condition as it makes me wonder who may have owned it and what kind of use it did (or did not) get. Sparkling Galaxy Pearl is one of those “rare” Ludwig finishes and my favorite from Ludwig. Galaxy Sparkle originally debuted in the 1962 catalog and the last catalog presence was in 1964 though there were drums made well after that. The wrap on the kit is still very vibrant. The pink, blue and red colors are still strong. It’s a fantastic set for under stage lights and even in daylight as the set changes colors with all different lighting. Late last year, thanks to fellow Drum Forum member Mr. Rick Grier, I was able to add the matching Pioneer snare drum dated June 7 1965. However, a Super Classic set came with a Supraphonic. So in keeping with tradition, I also added the matching COB Pre Serial Super Ludwig 5x14 snare drum. The set sounds amazing and the 22” kick really booms with a great low end thump. The 13" & 16" have great tone and project wonderfully. I have Powerstroke 3 heads with felt on the bass drum and Vintage Coated Emperors on the toms with clear Ambassadors on all the resonant heads. It’s a BIG, full and loud drum set that, when even played at low volume, just has THAT undeniable Ludwig sound! This kit is a dream come true for me an d I am extremely proud to finally have this amazing instrument in my collection. It gets played at the BIG shows! So cheers friends! May all of you one day cross that bucket list kit off YOUR list. Until next time, PLAY those drums!